Do you have Amsterdam travel plans? Great, because the "Venice of the North" is one of the most beautiful cities of Europe. But... The Amsterdam tourist industry is loud. Thousands of tour operators, guides and restaurant owners are screaming for your attention. Where will you turn to for independent, reliable information? This site was written by local residents who once arrived in Amsterdam too, and fell in love with the place. Together we've visited thousands of restaurants, cafes, shops, museums etc. etc. - gems and tourist traps. We know which ones are worth your precious time and money, and we worked hard to map this out for you in a concise, pleasant to read format. - Some of Amsterdam's most beautiful spots include the Old Church, Amsterdam's oldest building now located at the heart of the Red Light District; the hidden Begijnhof, a court from the 14th century; the wonderful Vondelpark, traditionally the home to Amsterdam's hippy crowd, and much more. - As the number of tourists has doubled in recent years, waiting lines have even become longer. 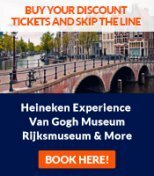 But here you can buy skip-the-line tickets to almost all Amsterdam attractions, and you will additionally get a discount of up to 10 euros per ticket that you cannot get elsewhere. - A top 7 of favorite Amsterdam activities. No trip is complete without sight-seeing the old city centre and taking a canal boat tour. Amsterdam has 1001 hotspots for going out, from cozy to hip and classy. Plus bohemian and glossy shopping you won't find elsewhere. - Read here which Amsterdam museums are really worth the visit and how you can avoid the waiting lines at the entrance. Of all museums in Amsterdam, the Rijksmuseum (showing the 17th century 'Dutch Masters') and the Van Gogh Museum are the most popular. - Whatever you think of it, the Red Light District is unique in the world. It has a laid back, relaxed atmosphere and is safe to visit. If you're not interested in the x-rated stuff, then the beautiful architecture in the Red Light area is still recommended. - Are drugs in Amsterdam really legal? Well, some, sort of. Here are all the details - and some warnings. There are quite a few tourist traps among the coffee shops, so check out our coffee shop reviews that list only the best. Use the coffee shop map to quickly locate them. - Amsterdam has a killer nightlife with night clubs like Paradiso, Escape and Jimmy Woo. Among the many cafes, the folksy Amsterdam brown pubs are a specialty. Urban type people will love Amsterdam's designer cafes. - A concise Amsterdam travel guide to the real highlights of the city, the best time to visit, the Amsterdam weather, getting to Amsterdam, getting around and lots of other practical Amsterdam information. - Amsterdam airport is one of Europe's major hubs served by hundreds of competing airlines, so finding cheap tickets to Amsterdam generally is no problem. Here's how flights to Amsterdam from each part of the globe work. ...then please share it with others: make a link from your site, blog or social bookmarking page. Every link helps!